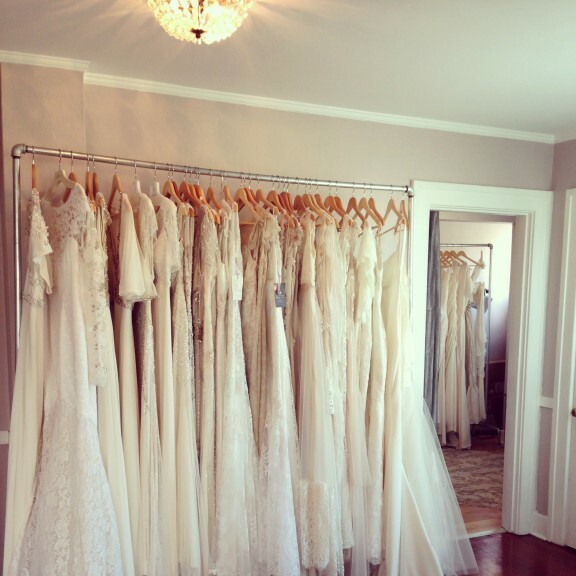 It turns out shopping for wedding dresses is nothing like they make it appear in the movies. Or at least it hasn’t been for me. Angels don’t sing. Stars don’t explode. Relatives don’t cry. There isn’t a sudden heart-stopping moment that this is, in fact, “the one.” To be honest, I always knew that I wasn’t the kind of gal for whom angels would sing or stars would explode but I did think I’d have some kind of moment where I could tell I’d found the best dress. Instead, my mom flew into town and we spent three (yes, three!!) days shopping for dresses, and since then I’ve been back to the stores we visited — and I’m more undecided than ever. Tomorrow morning I’ll return with my friend Keena to try and tie this business up once and for all. Cross your fingers. The one thing I have been pleasantly surprised with is that I actually like many of the dresses — a much better problem to have than not finding anything at all. And I’m finding myself drawn to dresses I never would’ve thought were much like “me.” I went in saying only simple, streamlined dresses would do and I’ve been getting kind of into some train action — even a little beading here and there. Who knew? Also, I’m in LOVE with the accessories! Bring on the sashes! In fact, I’d like to start wearing those silky wedding sashes to my yoga classes — why aren’t we all wearing more sashes? Fake camellias in my hair? Bring it. But really, if I had to sum the whole thing up, I feel like this is a way harder decision than I thought it would be and I know in the big picture of things it really doesn’t matter. That we will get married in September with all of our friends close by, and our families will meet for the first time and there will be pretty flowers and champagne and ice cream and I won’t be thinking for a second about the dress. I’m trying to look ahead and remember all of that this week, trying not to get bogged down in the little details and remembering the great party we’ll have. The recipe I decided to share with you today is appropriate for a few reasons. It’s all about looking ahead — to the colors of spring and the act of preserving which always reminds me of warmer weather and planning for future meals, moments and days. 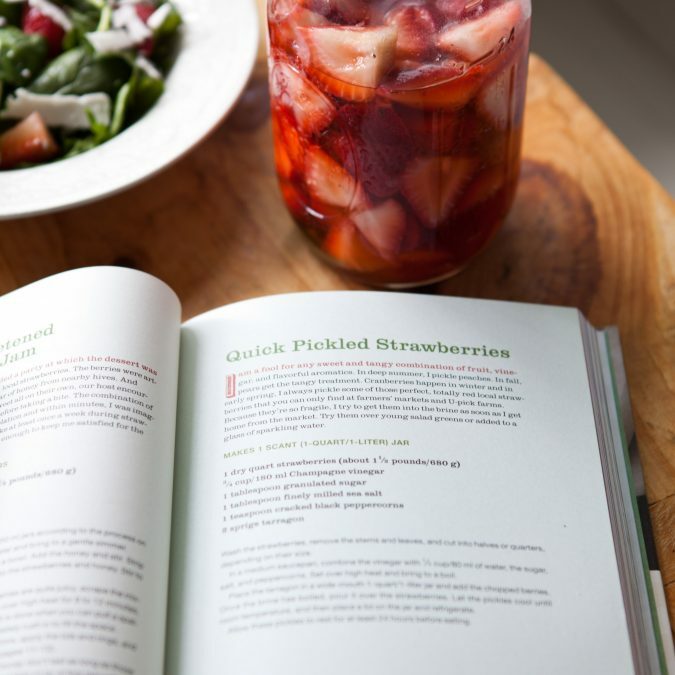 It’s a recipe for Quick Pickled Strawberries from Marisa McClellan’s newest book Preserving by the Pint and it’s given me the full, forceful nudge I’ve needed to get excited about spring. (Sam would like me to mention here that “quickled” would be a more apt, if not fun, term. I’m on the fence.) I’ve said it here before: I’m not much of a canner. There are a lot of things I’m good at but finessing hot water baths, rubber gloves, and dozens of jars is just not one of them. One of the things that’s long frustrated me about canning is the scale the recipes are written in. I don’t actually want 12 jars of peach jam; I want a few jars to enjoy using a handful of peaches I picked up from the farmers market. So I was truly delighted to receive Marisa’s book in the mail last week. I think it’s going to change things around here this season. Most of the recipes in Preserving by the Pint are designed to yield just a few jars. In the introduction, Marissa notes that “Preserving on this scale means that I get to explore different flavor combinations without ever committing massive amounts of produce to an idea that might not work out. It also allows me to have three or four dozen different kinds of jams, conserves, and sauces in my pantry.” On my list in the spring chapter alone: Honey-Sweetened Strawberry Jam, Mustardy Rhubarb Chuntney, Sorrel Pesto. Now what does one do with strawberry pickles? I have really fallen in love with these little ruby gems. They’re snappy and slightly acidic and bright. They’re really wonderful on salads or as a garnish in your favorite cocktail. Perhaps best of all, they’re super quick and don’t require any processing: you simply put your jar in the refrigerator overnight and the next day you’ve got beautiful strawberry pickles! If only choosing a wedding dress were so easy. The only little tweak I made to Marisa’s recipe was in the amount of sugar — she calls for 1 tablespoon and I used just a touch less. I’ve been using my berries in a salad made of simple greens, shaved goat feta and a lemony vinaigrette. It’s been deemed the salad of the season around here. I’d love to hear what you do with yours. Please note that the strawberries must sit for at least 24 hours in the refrigerator before enjoying and that time isn’t factored into the breakdown above. Wash the strawberries, remove the stems and leaves, and cut into halves or quarters, depending on size. In a medium saucepan, combine the vinegar with 1/3 cup / 80ml water, the sugar, salt and peppercorns. Set over high heat and bring to a boil. Place the tarragon in a wide-mouth 1-quart/1-liter jar and add the chopped berries. Once the brine has boiled pour it over the strawberries. Let the pickles cool until room temperature, and then place a lid on the jar and refrigerate. Allow the pickles to rest for at least 24 hours before eating. I was stuck for quite a while with looking for a dress when we got married - I knew roughly what I wanted but thought I was going to have to go shopping in NY in the days before the wedding until I stumbled upon one online which was exactly right. Fingers firmly crossed for tomorrow morning! I love the idea of these strawberries in a cocktail! Also, do I spy the pretty Dress Theory interior in your photos? 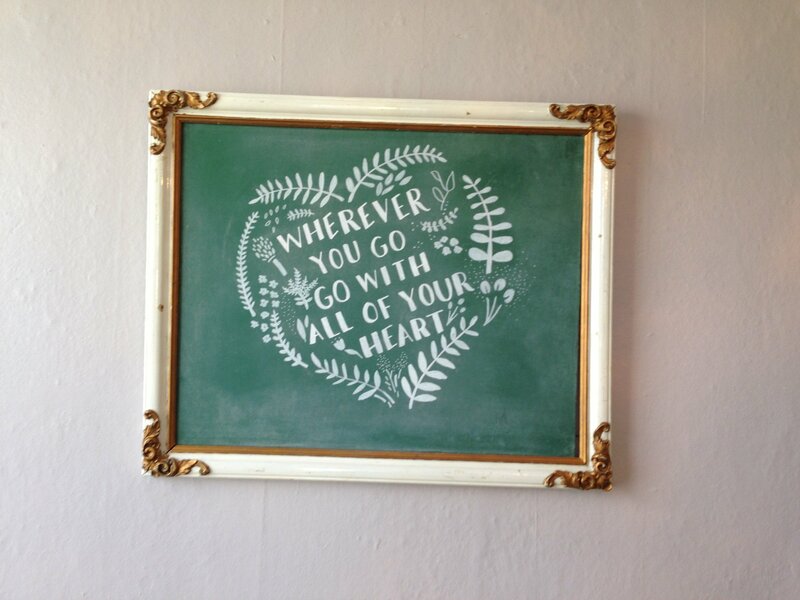 I was there last weekend with my mother, too, looking for my wedding dress. What a fun coincidence. I was surprised by how much I like the hair accessories! Wishing you the best of luck this weekend! If you haven't already discovered it, A Practical Wedding (www.apracticalwedding.com) is a fantastic pre- and post-wedding and marriage) resource. It goes way, way beyond the usual wedding eye-candy. I began reading it in 2008 when I was engaged and I'm still reading it today. Highly recommended. I'm getting married in August, and while I'm super excited to get married, and even more excited to be married, wedding planning has been the bane of my existence. It is my least favorite thing on earth, and I'll gladly clean my entire apartment to avoid a conversation about flowers or guest count. Ugh. When I was looking for my dress, I found one I loved, waited for it to drop down in price because I couldn't afford it, and lost it. I found another I could afford that I liked, almost bought it, but couldn't bring myself to do it. I finally found a dress that I loved and could afford, six months into shopping. I hope that you find the one that makes you glow. And these strawberries look beautiful. I love your suggestion of using them in a cocktail. When spring comes to Minnesota I'll be remembering this recipe. I love "quickled"! I'm officially adopting it. I make quickled red onions all the time, but would never have thought to pickle strawberries. I'll be trying this technique this week for sure (probably right as my over ambitious market strawberry haul starts to look sad). I hope you find a wedding dress you love, even if you don't have your "angels singing" moment. I never had the "THIS IS THE DRESS!" moment either, but I loved my dress and felt pretty in it, so I figure that's all that matters. Good luck! Just picked up your book and can't wait to start cooking. yum! I bet these would taste great with frozen yogurt too! Congratulations and best of luck finding the stars exploding, relatives crying, music playing dress!!! This looks delicious. And the combination of these over some greens and feta... gettouttaahherrree. What a wonderful recipe. Think I'll get the book too as it sounds like it has some unusual combinations of fruits and spices. Pickled strawberries with tarragon, wow! 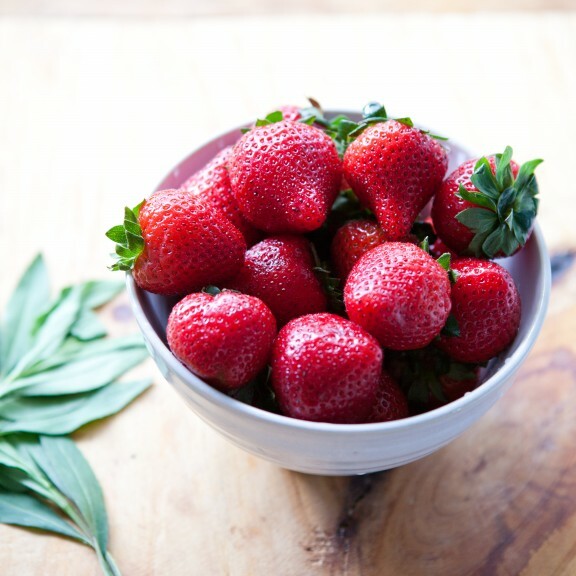 What a special way to welcome the strawberry season - love the idea of strawberries with tarragon. Best of luck finding the right wedding dress! Well good luck with the dress! They all look beautiful in the photo! 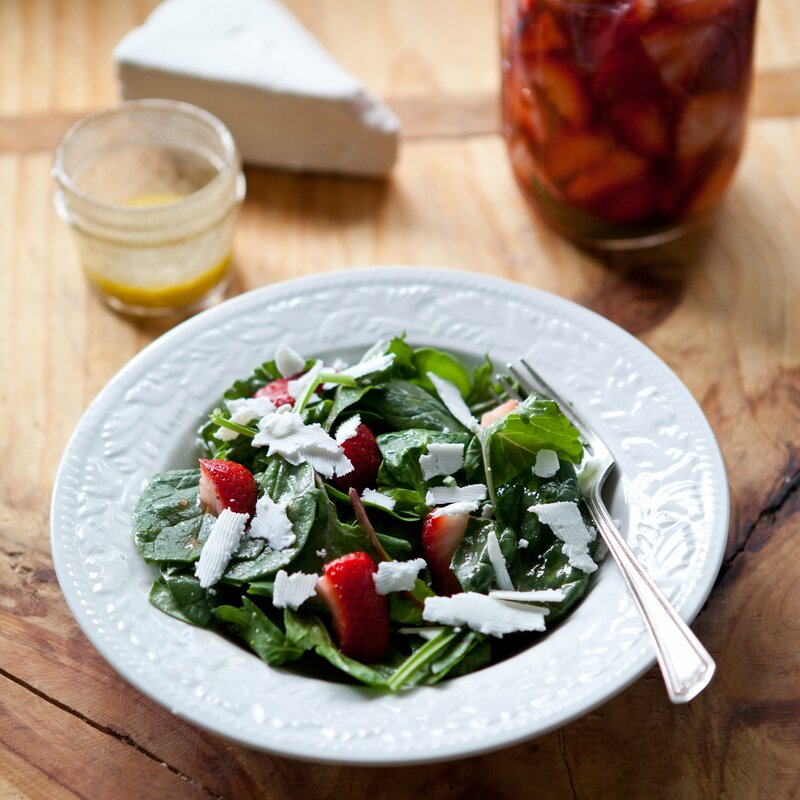 This salad is outstanding and the pickled strawberries take it over the top! Beautiful! I, like you, never had that "aha" moment I was hoping for. But, the stressful process was enjoyable nonetheless. I am sure whatever you choose will be great (even when/if two weeks leading up to the event you freak our and are sure you've picked the wrong dress). And those sashes! I loved them. They cinch in your waist and make everything look better. I hope you are having so much fun with the planning! Hope you found 'the one' -- honestly, I too enjoyed the process much more than I anticipated. And even though I ended up getting the first dress I tried on (came back to it after a few more outings of looking) it was fun to 'play' a bit. Can't wait to see pix! Love the "quickled" strawberries, can't wait to put them into a cocktail...and then a salad! And I agree, many of the recipes for canning are such large batches that it's not only intimidating, it requires so much time and money. I'll definitely check out the cookbook! I didn't have the "moment" when I picked out my wedding dress last year. I really liked my dress (and a few others too), I felt gorgeous in it, but I didn't know with absolute certainty. But everyone else was so excited and I liked it well enough that I went with it...and came to love it, especially once the accessories joined the party. Good luck and go with your gut! And we should totally start wearing sashes and hair flowers daily. These pickled strawberries sound too good not to try. Good luck with your wedding dress shopping. I'm sure you will look beautiful, no matter what! Oh Congratulations Megan! I didn't know you were engaged! I just got engaged last October & we're getting married in September as well. I know what you mean about shopping for dresses- I was certain I knew what I wanted before going in, then something in you takes over and you just want a lot of lace! haha. I just wanted to say congrats and good luck!! Shannon-TOTALLY. Lace sneaks in somehow, doesn't it? Too funny. Yes I think I knew you were engaged maybe from Facebook? So happy for you guys, and I think September is one of the best months in Seattle. Hope the wedding planning is going well for you! SO MUCH WORK! You WILL think of the dress at your wedding if it's uncomfortable. Not that you asked, but my advice is to pick the most comfortable of the lovely dresses you like. My dress was only slightly uncomfortable when I tried it on (boning + itchy lace), but wildly uncomfortable after standing for 4+ hours. I wish that I'd picked the dress that felt as comfy as a t-shirt at the store. I would have had more fun and hugged more people if I'd felt more comfortable.